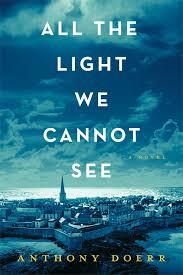 All the Light We Cannot See by Anthony Doerr is one of the best books I have read this year. I was so impressed with this novel that I am planning to look into Doerr’s previous award-winning stories. This powerful story is about a young blind girl who lives in Paris with her father, a locksmith employed in the historical museum, and an intelligent young orphan boy and his sister who live in Germany during World War II. As you may guess, their vastly dissimilar lives eventually become connected, but prior to that, a gripping story of the effect of the war on their daily lives unfolds. The story not only encompasses the brain washing of youths during the Nazi regime, it also includes their systematic pillaging of the world’s great treasures. One of the characters in the book has in his possession a precious stone rumored to give immortality to whoever owns it. A dying Nazi treasure hunter in the story is desperate to locate the jewel. Another character in the novel is a World War I veteran with agoraphobia. This is a story of redemption and the numerous ways in which people live in darkness. The characters are well-defined and believable. One of the most important criteria I base my reviews on is whether or not a book made me feel something. This book did and that is good writing. The book jacket states the author worked on this novel for ten years. It was time well spent. This entry was posted in Uncategorized and tagged All the Light We Cannot See, Anthony Doerr, Books, France, Germany, Nazis, WWII. Bookmark the permalink. Will look out for this one. My latest read that ‘made me feel something’ (to use your excellent phrase) was a South African novel ” The Sea of Wise Insects” by Terry Westby Nunn; a complelling read, a complex novel, and very cyurrent South Africa. Highly recommend. Alison, just began reading your recommendation! Loving it already! Thank you for guiding me to it. Thank you Alison for the book recommendation! I am always interested in knowing what books are trending around the world! I hope you will be able to read and love this book as much as I did. The more reviews of this novel I see, the more I want to run out and buy it right now! Everything I’ve heard about this book is so positive. I can’t imagine spending 10 years on one project but it was obviously worth it since it seems to have such an impact on it’s readers. It really is a wonderful story and incredibly well-written. I am grateful to have read it. Please if possible, touch base with me after. you have read it with your thoughts!